Stout might be regarded by many people as the most popular drink in Ireland, but the truth is that Irish breakfast tea is a far more important drink for the Irish. Ireland is one of the most tea-loving countries in the world, with an estimated average consumption of an incredible 1,300 cups per person each year. Among the country’s firm favourites is Irish breakfast tea, which is actually consumed throughout the day. One of the pioneers of the introduction of tea to the country was Samuel Bewley, whose Irish tea legacy still lives on today. Most black tea producers that sell blends will have an Irish breakfast tea to offer. If you are a real connoisseur then you might be interested in reviewing this list to see whats on offer. 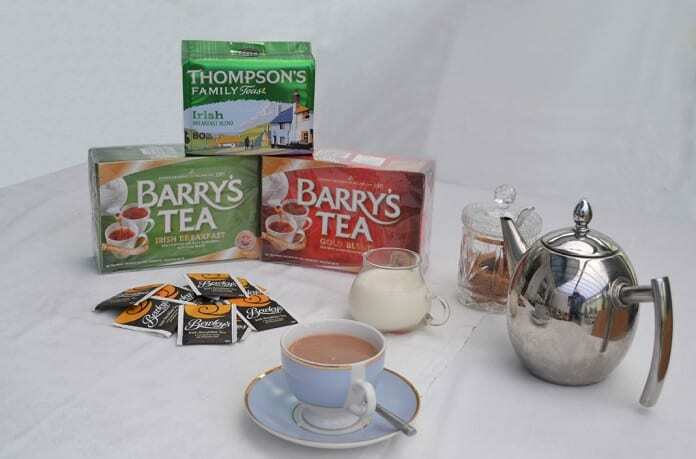 The quintessential Irish tea brand is of course Barry’s Tea, a home grown Irish brand that has been around since 1901. It is available is the USA and Canada here – find your nearest distributor. Tea was first introduced to Ireland in the mid-18th century. At around the same time it also took off in that other well-known tea drinking country, England. However, it was far from a popular pastime at first because Irish tea was extremely expensive. At the time it was only available to the rich. Tea consumption became a status symbol because it was beyond the reach of so many people. Inviting guests to a tea drinking party at home was a step on the ladder to social success for many upwardly mobile Irish families. Part of the reason for the high costs was the fact that the tea was grown far away and a small clique of firms, including the East India Company, controlled the movement of this and other goods produced abroad. Shipping costs for exotic products such as Assam (a key ingredient in an Irish breakfast tea blend) from India were also subject to hefty tariffs. These were reduced in the late 18th century making the product more affordable. Entrepreneur and merchant Samuel Bewley made the brave move to cut out the middle man thus cutting costs and tea became more widely available. In 1935, Samuel and his son Charles decided to take on the big players by importing 2,099 chests of tea directly to Ireland aboard the Hellas, the first ship to be chartered directly from Canton to Dublin. It was a risky move, not least because the losses they faced if anything went wrong would have been considerable. Potentially angering the established trading companies’ oligarchy was another gamble. Luckily for them, it paid off. With a successful supply line established, Samuel and his son were able to reduce the price of their tea. They found that Ireland was a most receptive market. By the middle of the 19th century, tea was popular throughout the country for all classes. Not all teas are the same. Whilst some of the blends that initially found their way to Ireland might not have had the highest quality. Once direct trade was established with tea-growing countries, Ireland was fortunate enough to enjoy superior produce. In the early days of mass tea consumption, tea was sourced mainly from India, China and Ceylon, now known as Sri Lanka. Chinese teas tend to be quite fragrant and delicate in flavour with white, black, yellow, green and oolong being five of the main types. Floral teas such as jasmine are also popular with the Chinese palate. These light teas are usually served without milk. Indian teas typically have a stronger taste. Assam tea is grown in the Indian lowlands, where the high temperatures and long rainy season create ideal tea-growing conditions. The leaves have a strong, malty flavour and give the tea a rich, bright colour. In contrast, Darjeeling grows in the highlands of north-eastern India and has a slightly floral flavour and aroma. One of the reasons that tea is so popular in Ireland is because the country enjoys some of the world’s finest produce. A substantial proportion of the tea that was consumed prior to the Second World War arrived in Ireland via the English auction houses; this supply was cut off when Ireland took a neutral stand during the conflict. This forced Ireland to seek alternatives. Continuing in Bewley’s entrepreneurial spirit, Irish tea companies moved towards importing directly from the countries of origin. The creation of Tea Importers (Eire) Ltd by the Irish government in 1941 meant that trade took place directly with the country of origin. In fact, until Ireland joined the EEC in 1973, all other types of trade were prohibited. The result was that Ireland became accustomed to only the very finest teas. Additionally, tea companies began to experiment with importing teas from other regions in order to experience different flavour profiles. Sri Lankan or Ceylon tea was introduced in the 1960s, and Kenyan tea found favour just a few years later. Both of these can be enjoyed alone or combined with other types of tea to create new and interesting drinks. Breakfast teas tend to be blended using a combination of two or more different types of leaves. Classic combinations include Assam and Darjeeling, although Ceylon and African teas are sometimes used. The Irish love of tea could be partly due to the extraordinarily damp climate of the country. When you live in a place that experiences rain on an almost daily basis, a hot cup of Irish breakfast tea is just the thing to warm the body and soul, making everything right with the world again. If you visit an Irish pub during the day, you’ll find many customers enjoying a nice cup of tea rather than drinking a pint of beer. Mid-morning and mid-afternoon are prime tea drinking times, with the brew often served alongside a little slice of cake or a biscuit. Many people enjoy drinking tea with their lunch, and the early evening meal is also often accompanied by a cup of strong, sweet tea. It might sound incredible now, but tea drinking was once regarded as a dangerous pursuit. The consumption of this seemingly innocuous beverage was compared to drinking alcohol. Its effects on productivity and health were believed by some to be just as harmful. The actual contents of the brew were not in question. It was the time spent drinking tea that was regarded as time poorly spent and a sure-fire way to waste precious money. Women were particularly deemed to be subject to this apparently pernicious influence. With tea drinking regarded as a frivolous activity, it meant spending less time on household duties. The exotic origins of the leaves used to make the drink were also considered suspect. Fears that they might contain addictive drug-like qualities added to controversy. In addition, many members of the age’s patriarchal society feared that allowing women the opportunity to socialise regularly over a hot drink might encourage them to revolt. Who knew what anarchic ideas these women might come up with together whilst indulging in this most radical pursuit? This fear of mutiny was another reason that women were banned from entering coffee houses. These were solely the preserve of men, who met over caffeinated beverages to discuss matters of great importance that were judged unsuitable or irrelevant for ladies. The consumption of tea was regarded as so threatening to the very fabric of society. So much so that “improvement pamphlets” were given to the poor in the early 19th century to discourage use. Fortunately, common sense eventually prevailed and drinking tea is now regarded as an entirely socially acceptable activity to enjoy. How should the perfect cup of Irish breakfast tea be served? Ireland is a country that is in love with its dairy produce, so the only acceptable option is with milk. Teabags were not really popular in Ireland until the late 1970s. Actually, many households still use traditional loose leaf tea because they believe it has a superior flavour. Bewley Irish breakfast tea has a deep Assam flavour, so it is slightly spicier than many other blends. It is quite commonplace to add a little sugar to bring out the malty notes of the brew. The tea should be steeped for several minutes to allow the flavour to fully develop. Thanks in part to Bewley and his fellow traders, Ireland as a nation has been able to enjoy tea for almost two centuries. A cup made with the finest Assam and a touch of Darjeeling denotes the perfect Irish breakfast tea. As far as Irish tea drinkers are concerned, any time is tea time.